Cinnamon or dalchini is one of the most common ingredients in Indian cooking. 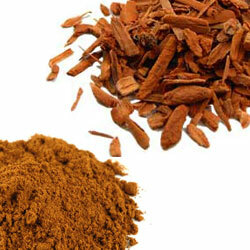 Known for its aromatic and pungent characteristics, cinnamon is mostly used as a falvouring agent. But this spice is packed with innumerable compounds that make its essential oil a panacea for most ailments. Arthiritic Pain – Mix 1 teaspoon of Dalchini powder with 2 portions of water and 1 portion of honey to make a thick paste. Apply this paste on the painful parts of the body. Loose motion – Mix 3 grams of Dalchini powder with 1 cup of water and consume it twice a day. Pimples, Acne and Black heads – Depending on affected areas, mix a few pinches of Dalchini powder with a few drops of lemon juice and apply it on acne and black heads twice everyday till the time they disappear. Hair fall – Prepare a mixture by adding 1 teaspoon of Dalchini powder and 2 teaspoon of honey to 100 ml of warm olive oil. Store this mixture in a bottle after the dalchini powder mixes evenly in the oil. Apply this oil thus prepared on the scalp and keep it for 15 to 30 minutes before washing it off. Over-weight – Boil a cup of water and add 1 teaspoon of honey and 1/2 teaspoon of Dalchini powder. Then cover it and steep for 1/2 hour. Finally add some honey and drink 1/2 of the liquid before going to sleep and the rest of it the next morning in empty stomach. This will help in losing weight if you continue this till you get results. Bad breath – To reduce bad breath, rinse (wash) your mouth with solution of 1 cup water mixed with 1 teaspoon of Dalchini powder. Dull complexion – To lighten skin complexion, take 1 teaspoon of honey, mix it thoroughly with a pinch of Dalchini powder and apply it on the skin. Cough – Take ¼ teaspoon each of dalchini powder and clove powder, 1/2 teaspoon of ginger juice and mix it thoroughly in a cup of boiling water. Consume it after cooling. Continue it for few days. Headache – To reduce headache, take 1 teaspoon of water and add 1 teaspoon of Dalchini in it. Apply this on the forehead. Insomnia – Boil 1 cup of water and add 1/2 teaspoon of Dalchini powder, leave it for 5 minutes. Finally add some honey for sweetness, stir it well and drink it twice a day to induce sleep. Sore Throat – To get rid of cold and sore throat, boil a cup of water and add 1/2 teaspoon of Dalchini and black pepper powder. Finally add honey and drink it.